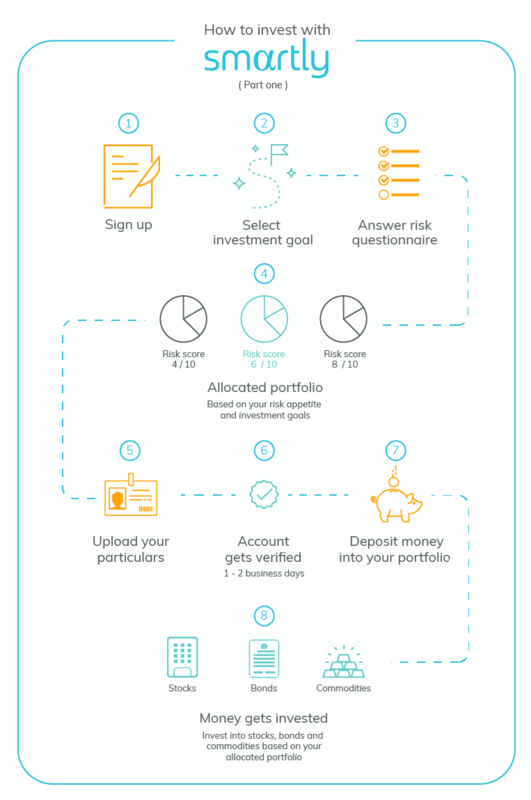 Firstly, you will have to go through the risk assessment process for us to recommend an investment portfolio which meets your financial goals and needs. The process will only take a couple of minutes. After we recommend you the investment portfolio, we’ll bring you through the sign-up process which you have to submit your particulars and relevant documents for us to conduct a necessary background check. Depending on the time and day which you submit the documents, we’ll take up to one business day to validate your account. Once your account has been validated, you will be granted access to our platform and explore all the functions freely. To get started with investing, you can head over to the ‘transfers’ tab and click the ‘add money’ button. We’ll provide you with our bank account details together with the accompanying instruction. Like other financial platforms, you’ll have to do a bank transfer and we’ll record your deposits within one business day. You can transfer any amount but you need to have a minimum balance of S$50 in your account for us to invest. Once your deposits have been recorded, these funds will then be used to purchase your ETFs when the market opens at night. The whole sign up process will take less than 5 minutes, but the verification and investing procedure will require a total of 1 – 2 business days due to the need to adhere to regulatory requirements and for us to purchase the ETFs from the US stock exchange.